Get a price suggestion for free! It's never been this easy to sell a car, we give you a price suggestion for free. 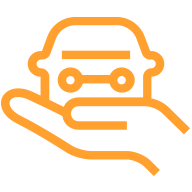 In the next step you can fill in equipment and other things that affect the value of your car, after which we present you with a price suggestion, free of charge. You can also call us at +46 (0)10 167 30 52. If you are selling a company car, we offer to collect the car you want to sell where it is parked, no matter where in Sweden that is. So that you can spend your time on other things. If you are selling a private car, we offer the same transport solution, but currently only within certain regions. Are registered for sale by the owner or a family member of the owner. Have less than 270,000 km on the clock. Have at least two months until the next inspection period and have passed the most recent inspection. Are not sports cars, modified or tuned up. Sell your car, private or corporate? Make a free interest inquiry!